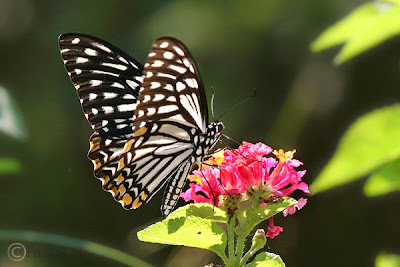 As we step into the final year of the first decade of the new millennium with trepidation, anxiety and concern at the tumultuous global economy, where jobs are at stake, and salaries in danger of going southwards, we look in anticipation for a silver lining towards a quick recovery. 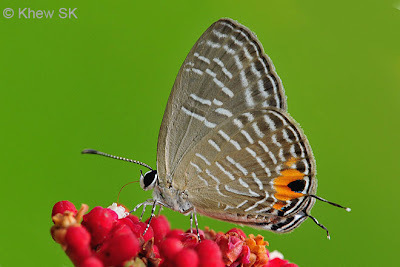 Whilst we spend the last few days of the Lunar Year of the Rat, and herald the coming of the Year of the (Earth) Ox, there should be some reason for cheer and a more optimistic outlook ahead but let's spare a thought for those who are less fortunate. 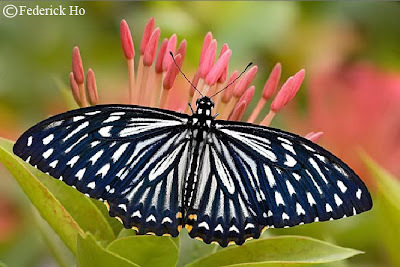 This month, we again feature a bright red butterfly species, for good luck and fortune for the start to 2009. 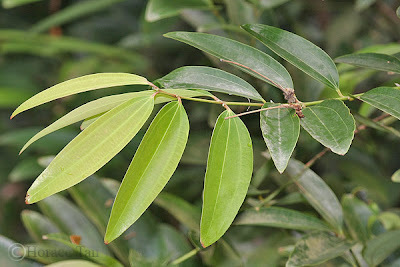 This month, we introduce the Cornelian (Deudorix epijarbas cinnabarus). 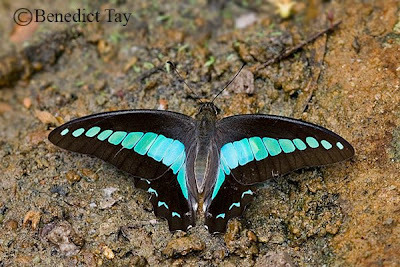 The male is orange red above, with broad black borders on the forewing, and the costal area broadly blackened on the hindwing. 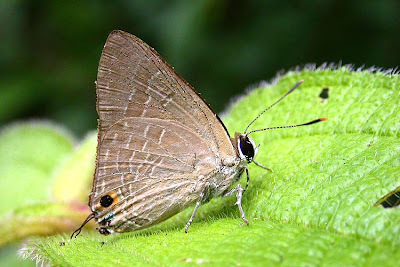 The female is dark brown above, and unmarked. 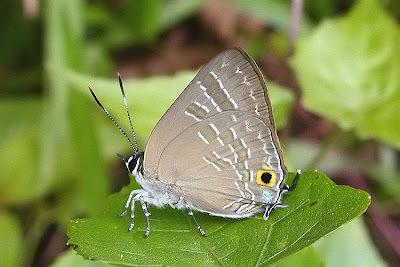 The underside is buff to greyish brown, with broad post-discal bands and cell-end bars and defined by narrow white stripes. 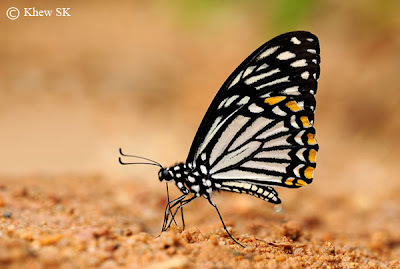 So how did the butterfly get its common English name? 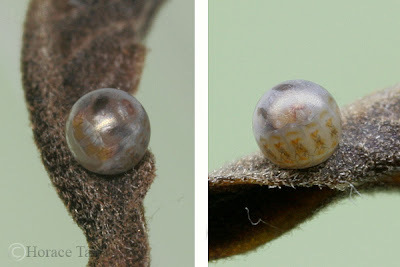 The word Cornelian is often associated with the semi-precious gemstone "cornelian" which is a red variety of chalcedony, which is cryptocrystalline quartz. 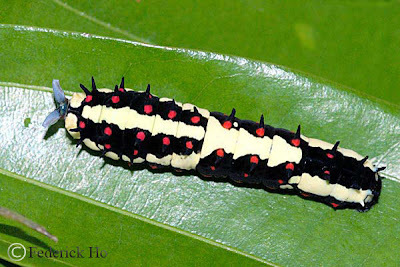 Its red colour is due to the presence of iron impurities in the form of iron oxide or hematite. 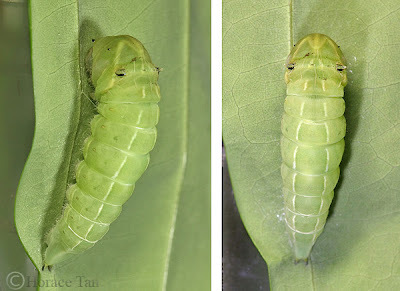 It can vary from a flesh red to a clear red. 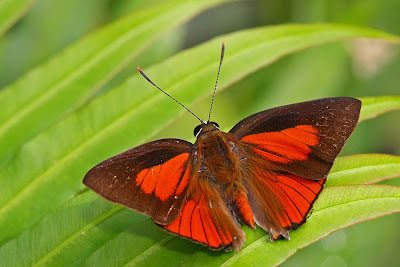 Looking at the bright orange-red uppersides of the males of the Cornelian, we can understand why it is named so. 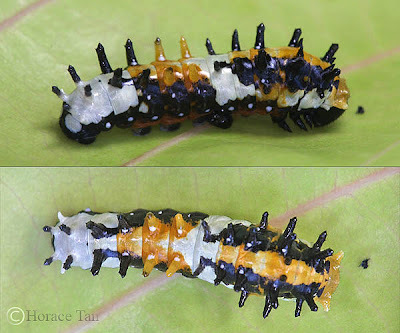 It has solid jet-black eyes, and the rather long antennae is orange-tipped. 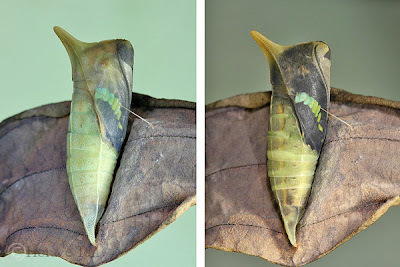 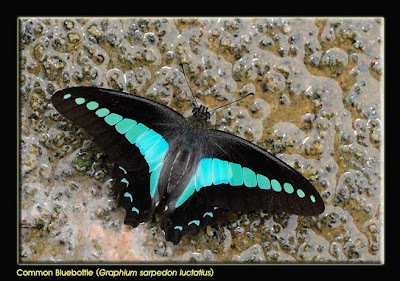 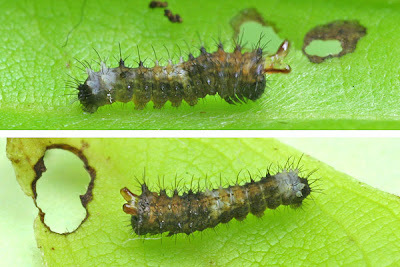 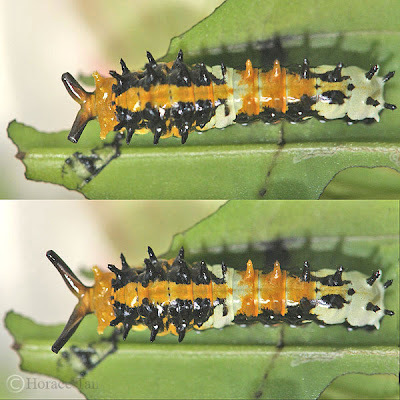 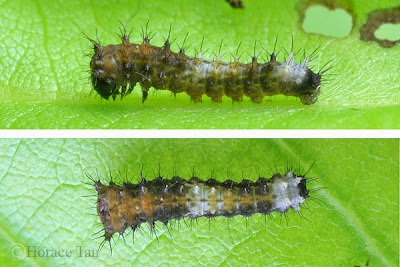 Each hindwing bears a filamentous white tipped tail, and there is a black orange-crowned eyespot at the tornal area of the hindwing, with some bluish-green iridescent scaling. 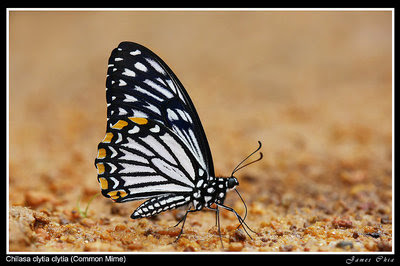 The tornal lobe is pronounced and bears a black spot with some orange borders. 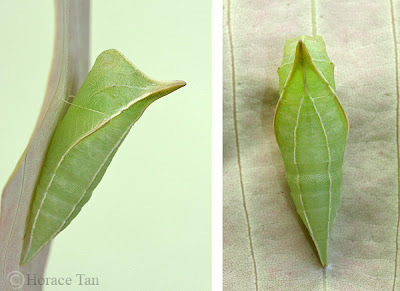 The Cornelian is rare and when encountered, the species is usually observed singly. 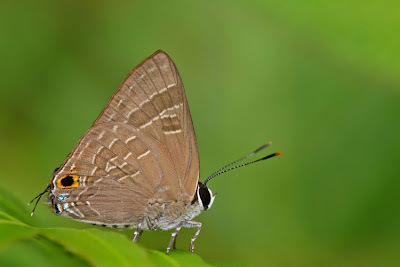 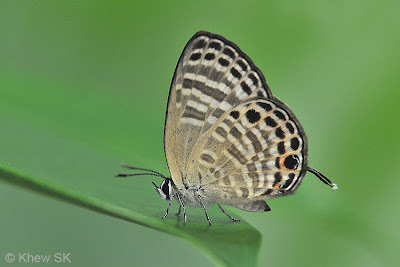 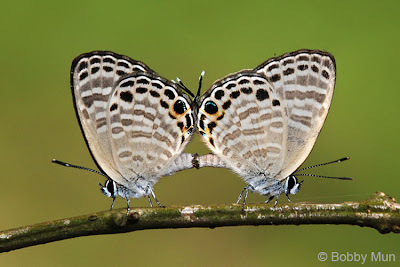 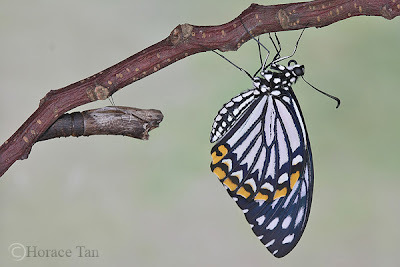 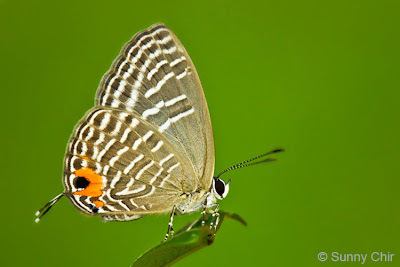 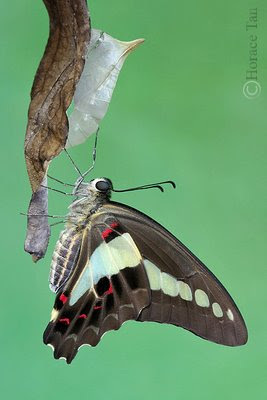 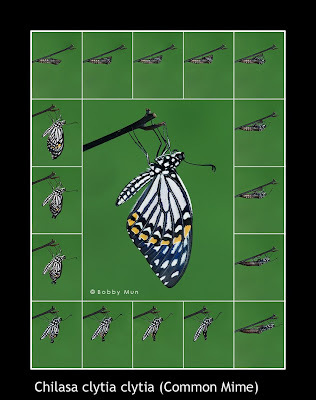 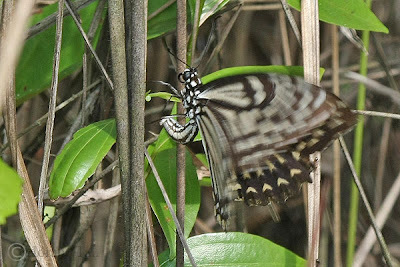 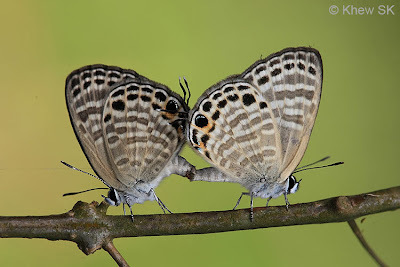 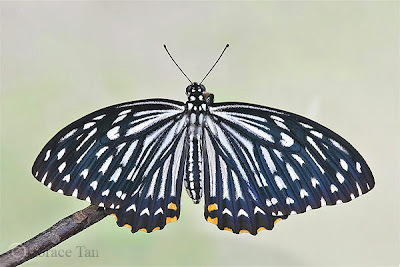 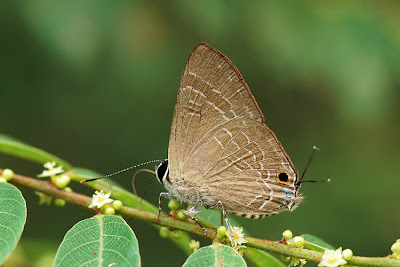 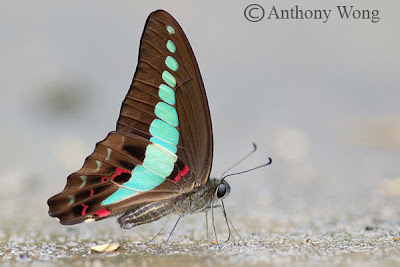 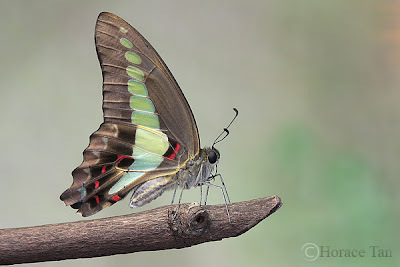 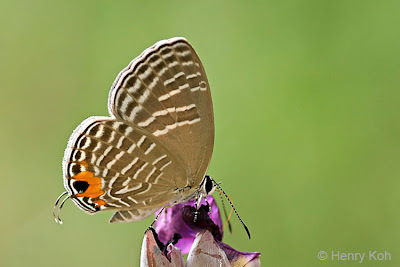 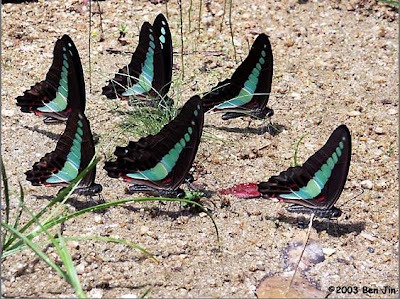 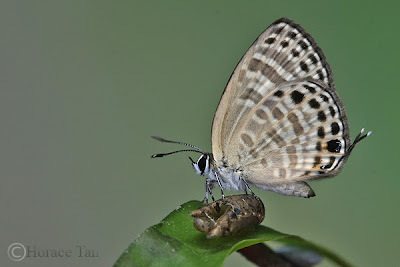 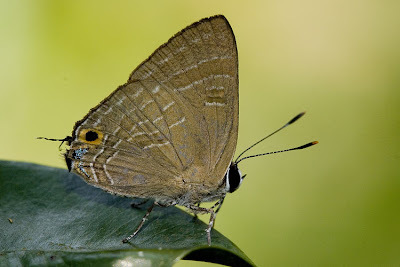 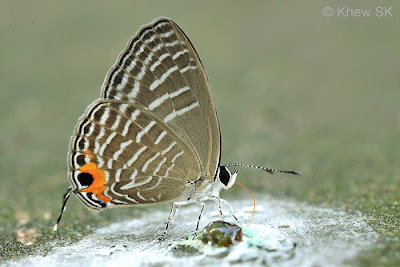 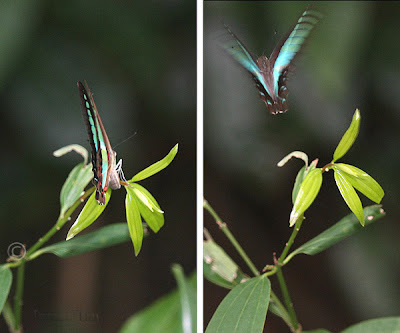 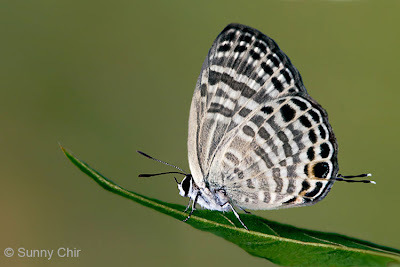 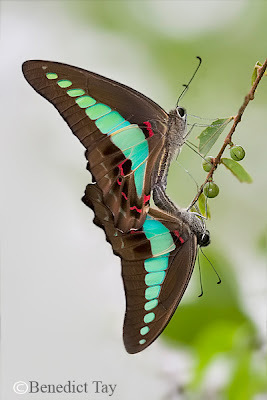 The butterfly is a rapid flyer, but is often observed easily when it stops to feed at flowering plants in the forest. 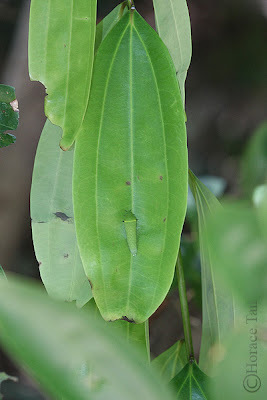 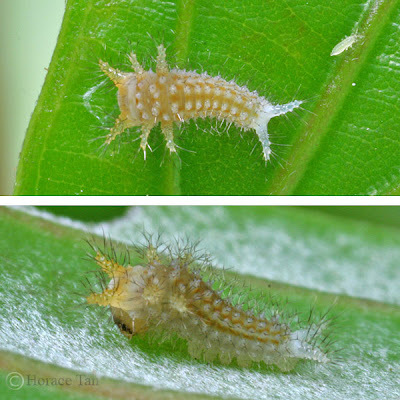 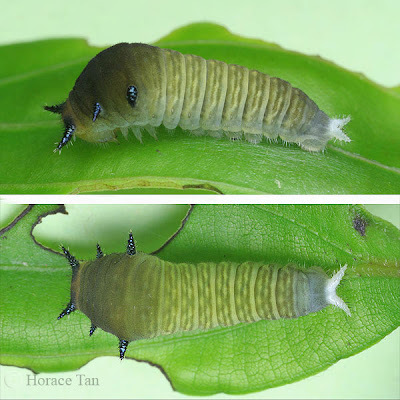 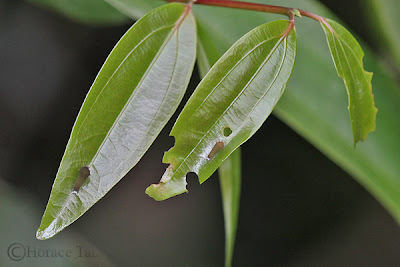 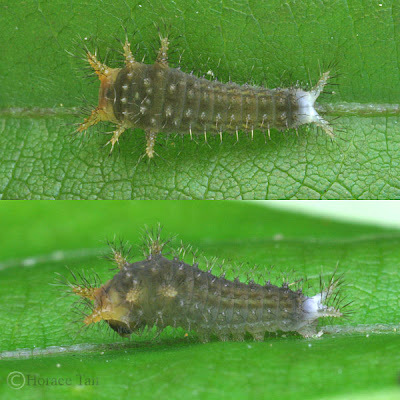 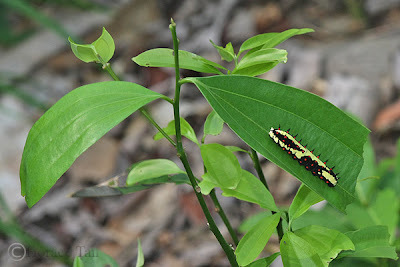 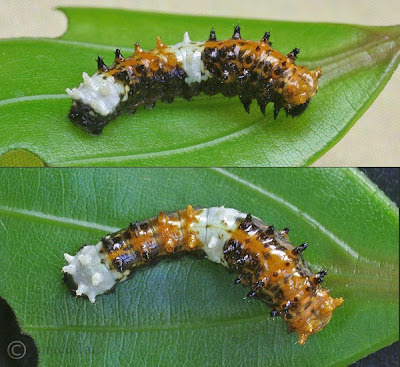 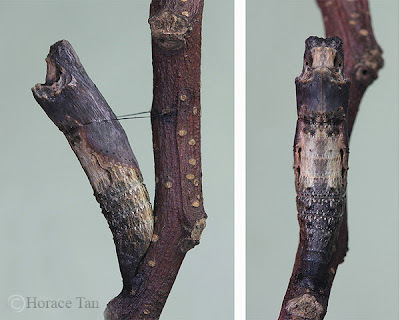 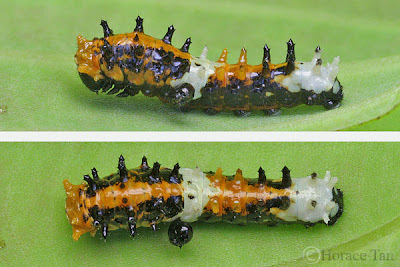 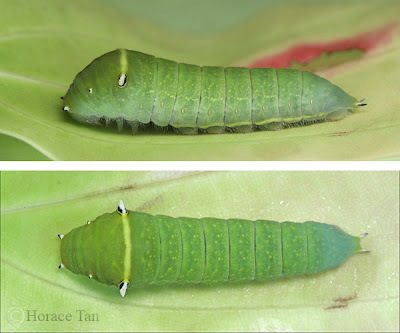 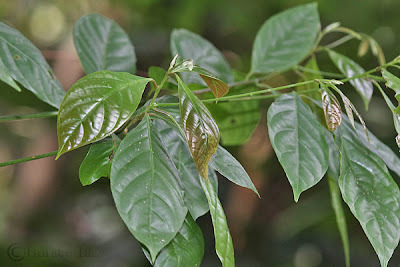 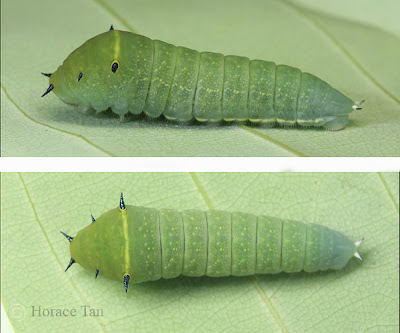 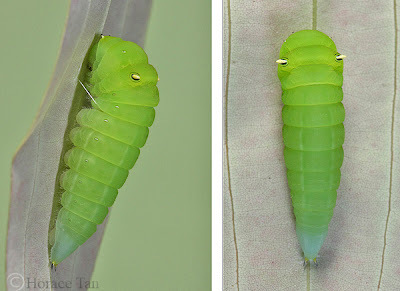 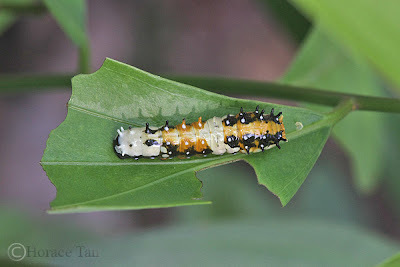 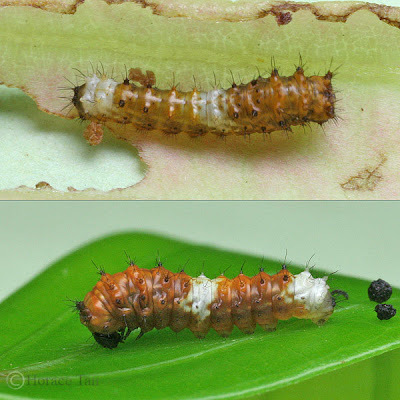 It is essentially a forest-dependent species, and is rarely seen outside the forested nature reserves of Singapore. 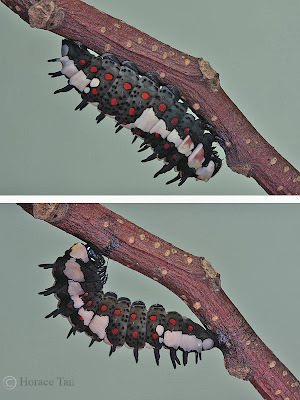 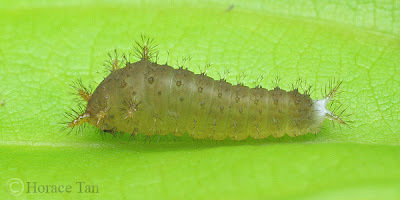 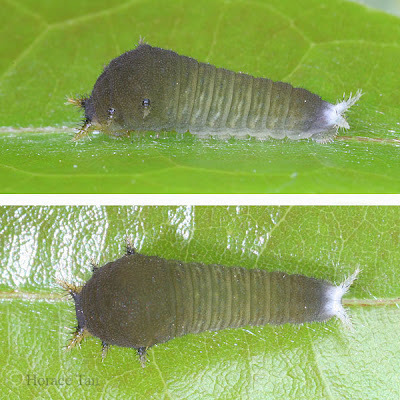 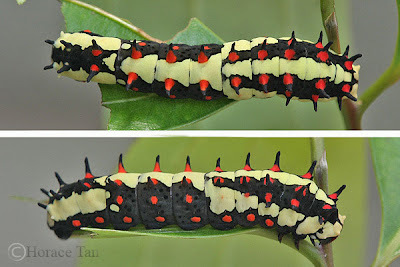 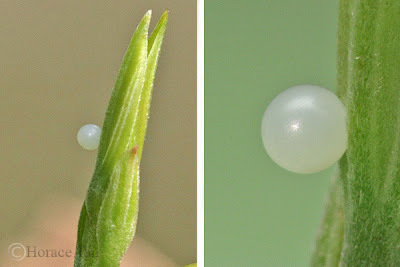 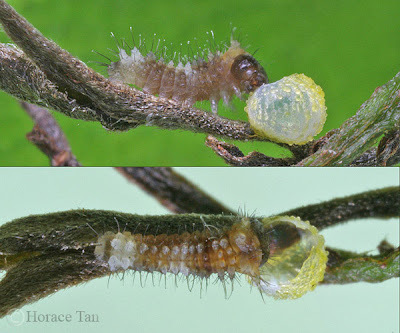 The caterpillars of the Cornelian are known to feed inside the fruits of the pomegranate and lychee, and probably a number of other similar pulpy fruits. 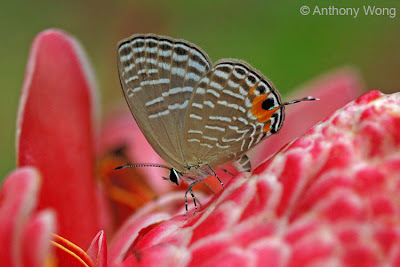 ButterflyCircle wishes all members and visitors a Happy & Prosperous Lunar New Year and Gong Xi Fa Cai!